On Tuesday, the usually crowded Central district of Hong Kong, the very heart of the financial hub, experienced an unusual flare of tension. The Foreign Correspondents’ Club hosted an event featuring Andy Chan, the 27-year-old leader of a fringe party promoting Hong Kong independence from China. The event may have gone unnoticed, but the Beijing and local governments, seizing the opportunity to underline Hong Kong’s continued lack of a national security law, sent pre-emptive warnings to the club. Pro-China protesters descended on the colonial-era clubhouse, with the Beijing government upping the ante and accusing the club of “inciting secession”. Chan’s messages did not fail to justify Beijing’s paranoia. During his session, he likened Chinese sovereignty over Hong Kong to a form of colonialism and national cleansing, invited Washington to extend the trade war against mainland China to include the independent economic jurisdiction, and described China as a “threat to all free peoples in the world”. Chinese President Xi Jinping has repeatedly called for strong actions against any attempt to disrupt the country’s unity and status quo. While the president’s message is primarily aimed at Taiwan – the self-ruling island currently in the hands of a pro-independence party under President Tsai Ing-wen – Xi clearly has Hong Kong in mind, too. When he visited the city last year, celebrating the 20th anniversary of handover from Britain, he used a keynote speech to warn Hong Kong not to cross the “red line” of undermining Chinese sovereignty, and said the city needed to improve the systems to uphold national sovereignty. That may well explain what is at stake for Chan and his Hong Kong National Party. Without either legislative representation or a big social media following, the fringe party is quite literally facing an existential crisis. Last month, the city’s police force formally advised the government to outlaw the party because of its secessionist leanings. The Secretary for Security, John Lee, said Hong Kong’s freedom of association “is not without restriction.” If the ban of Chan’s party is to proceed as expected, it will mark the first time since the 1997 handover that a political organisation has been ruled to be illegal. The provisional decision has raised concern internationally. Even the UK government, which has been courting China for a trade deal in the post-Brexit era, voiced its concern over developments in its former colony, saying that while it does not support Hong Kong independence, it is important for Hong Kong’s high degree of autonomy that its rights and freedoms are “fully respected”. The latest incident is politically thorny given the involvement of the Foreign Correspondents’ Club. Before the event took place, the Chinese Foreign Ministry’s office in Hong Kong took the undiplomatic step of requesting the club to drop the event. After it refused to do so, Beijing officials have openly voiced discontent with the club. Zhang Xiaoming, director of the Hong Kong and Macau Affairs Office in Beijing, accused the club of “unquestionable illegality” for aiding and abetting the incitement of secession. 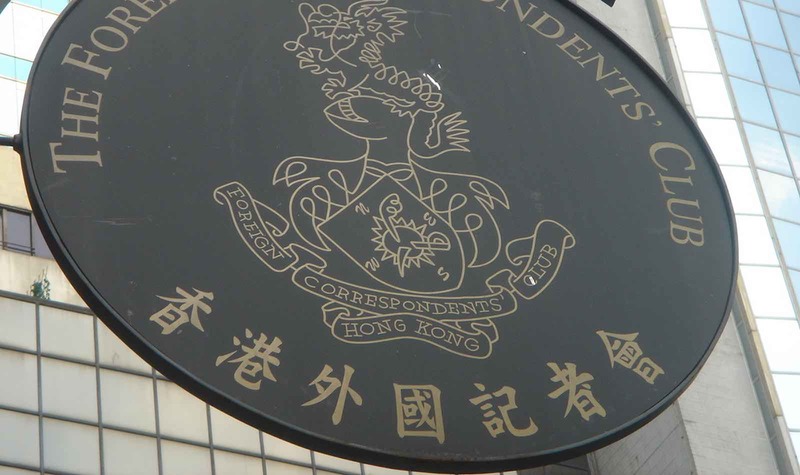 The Foreign Ministry’s Hong Kong office said in a statement that the club abused freedom of the press. As far as the Beijing officials are concerned, it seems impossible for them to stomach the assertion that the event was meant merely for journalists to neutrally understand a political agenda, rather than lending it support and giving it publicity. The final bulwark lies in the Hong Kong government. While the hawkish ex-leader Leung Chun-ying has called for a review of the clubhouse’s preferential government land lease, the current administration has refrained from any talks about terminating the lease on the grounds of illegal activities. Whether the club can keep its location beyond the 2023 lease expiry remains to be seen. The bigger picture goes back to Beijing’s increasingly interventionist approach towards Hong Kong’s domestic affairs. While the Sino-British Joint Declaration stipulates a high autonomy for the Hong Kong government, any reference to national security gives Beijing a convenient leeway to make a stance on how activities in Hong Kong should or should not be conducted. Just as the Foreign Correspondents’ Club event was on show, Hong Kong Chief Executive Carrie Lam went to Beijing as the central government, for the first time, included the office-holder in a national working group on the planning and development of the Great Bay area that includes Hong Kong. As Beijing prepares to flex its muscles on Hong Kong’s affairs, regardless of how it looks in the eyes of the international community, those pillars once considered sacred, such as the freedom of the press, look more fragile than ever.